A good night’s sleep can be hard to get when you wake up frequently with night sweats from hot flashes and then succumb to the cold clammy feeling afterwards. Then to add insult to injury, often it requires not only changing pajamas but also the sheets and pillowcases depending on the severity. This is the scenario most women going through cancer treatment, namely chemotherapy, face as they are often thrown into early menopause. When sleep is a key ingredient for allowing the body to heal, finding a workable solution to the effects of hot flashes becomes imperative. 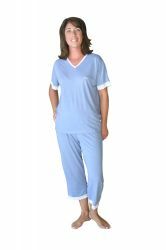 Wicking pajamas as well as wicking sheets and pillowcases are a great option. The fabric will wick away the sweat keeping you reasonably dry so you can continue on with your sleep. Borrowing the fabric technology from the fitness and sports industry, applying the wicking capacity in garments for cancer patients provides a wonderful solution to the nuisance and unpleasantness of hot flashes. ← How Do You Wear Bald – for Women!